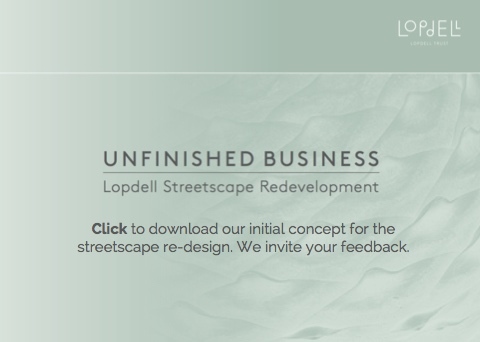 Visitors to the Lopdell Precinct will immediately notice the contrast between the design and finish of the buildings and the aging ad hoc state of street-front paving and public access ways along the northern and eastern frontages. The Lopdell Trust is keen to see these areas significantly upgraded to better complement the substantial investment that has been made in the Precinct’s heritage buildings and Te Uru. To see the Titirangi Road frontage redeveloped in a plaza style. 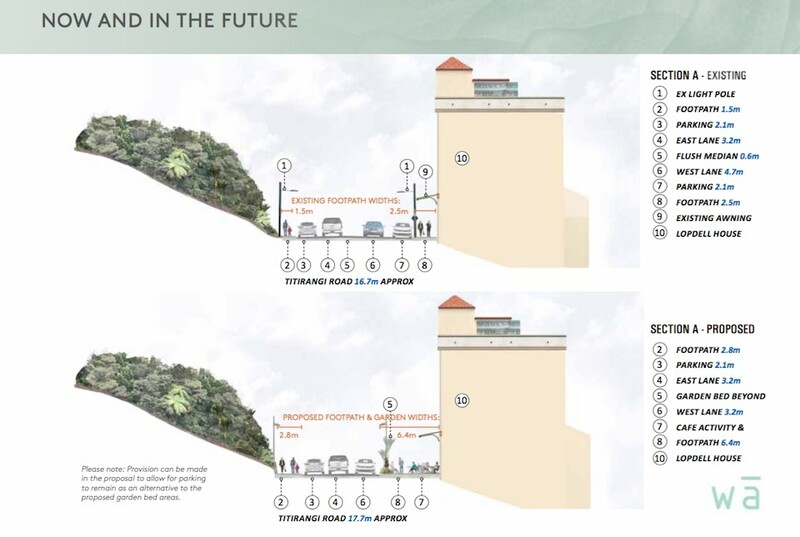 To improve pedestrian access down the South Titirangi frontage – the current steps are very awkward and difficult and the adjacent footpath is steep. The nature of these changes suggests that they should form part of a general street and roading redesign at the western end of the village. Such a redesign would complement the substantial development which took place at the eastern end of the village (the retail area) back in the 1990s and essentially encompasses the area from the western-end roundabout at the entry to Scenic Drive back to the traffic lights adjacent to the supermarket. To that end, the trustees have commissioned designers, Wraight and Associates, to undertake some initial concept planning and are working collaboratively with Auckland Transport, who have responsibility for the street frontage and roadway. Our key objective is to encourage Auckland Transport to develop a staged master-plan for the required upgrade that meets the trustees’ objectives and is strongly supported both by the Waitakere Ranges Board and our local community. Successfully developing such a plan would ensure that any investment the trustees undertake to the Precinct street frontages will not be at risk of being subsequently undone. Auckland Transport has a heavy demand on budgets – developing a commitment to a master-plan and securing the necessary funds is likely to take some time. The trustees anticipate making a financial contribution to agreed aspects of the plan that are significant to the look and improved functionality of the Precinct. Some money is already ear-marked for this purpose and the trustees will also be looking to develop multi-party funding partnerships to augment our budget – mirroring the processes by which the major work in the Precinct was successfully completed. Click for a more detailed look at our initial concept planning.